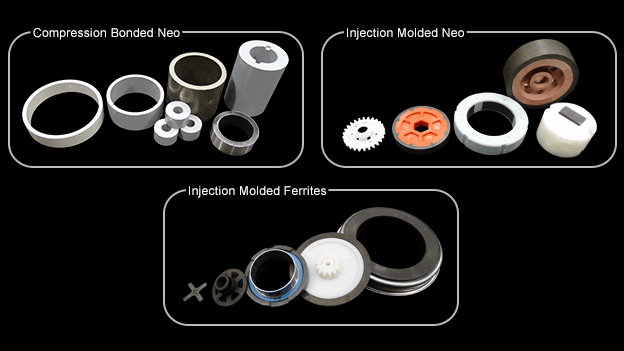 These magnets combine thermoplastic and thermoelastomer resins with magnetic powders in order to create injection molded, flexible magnets. These magnets are great for custom applications where a traditional, solid magnet would not offer the same type of value. 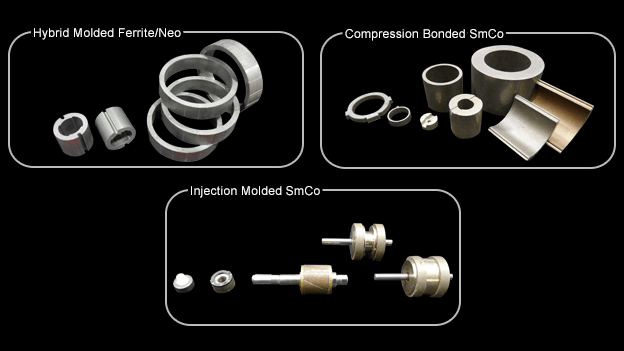 Injection molding is not the only process in which bonded magnets are created as bonded magnet manufacturers also utilize the compression bonding process in order to supply customers with a higher magnetic output. The trade-off between the two being that while compression bonded magnets offer a higher magnetic output, they are limited in the shape and sizes whereas injection molded magnets are rather flexible. These bonded magnets are great for a wide range of applications from sensors to brushless DC motors and just about everything else in between. The two different processes used to create the bonded magnets, injection molding and compression bonding, yield different characteristics when it comes to their final product. For example, a bonded magnets that is manufactured through the injection molding process has a very high mechanical strength, meaning it has a high tensile strength or that it can withstand a great amount of physical force. Compression bonded magnets on the other hand yield only a moderate amount of mechanical strength, but keep in mind that compression bonded magnets offer higher magnetic strength which can be attributed to their higher magnetic particle density. There are many options when searching for the right type of bonded magnet for your application and a lot of factors to consider when making that choice. The type of applications and your requirements are the most important to consider. Ask yourself questions such as: Will the magnet be exposed to extreme temperatures? Will the magnet be exposed to solvents or outside fluids? Can my application fit a traditional style magnet or do I require a more flexible solution? All of these questions are a great start to finding the perfect bonded magnet solution. Once you know what you are looking for, finding a trusted bonded magnet manufacturer is the next step in the process. They can help you fine tune your selection in order to better fit your application and will ensure that you receive the best possible bonded magnet based on your needs and requirements. Bonded Magnets Magnets are products that come in a number of shapes and sizes, and the magnets that have really pushed the mold have been bonded magnets.